Dolar Mahmud was born December 30, 1988. He is a Bangladeshi first class cricketer. A former Bangladesh Under-19's representative, he plays domestic cricket for Khulna Division. Mahmud has also played for Bangladesh A. He made his One Day International debut in 2008. Dolar Mahmud is a right-arm medium-fast bowler who was part of Bangladesh's Under-19 squad for the 2006 World Cup in Sri Lanka, where he didn't have much success, taking only four wickets in six matches. He was 17 then and has continued to be part of Bangladesh's U-19 plans. He toured South Africa in December 2007, where he picked up a five-for in a three-day game. Mahmud plays first-class cricket for the Khulna Division and even has a hat-trick, against Rajshahi, to his name. He dreams of playing international cricket for Bangladesh and the Under-19 World Cup in 2008 is the ideal platform to catch the spotlight. Find Dolar Mahmud profile and stats of batting, bowling and fielding including latest updated news of Dolar Mahmud, videos and images at Hamariweb.com. 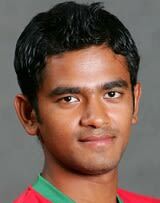 Also find detail Player profile and career statistics of Dolar Mahmud of Bangladesh. Dolar Mahmud - Find Dolar Mahmud of Bangladesh Cricket Team complete player profile, number of matches, runs score, wickets & catches, Statistics, Records, Dolar Mahmud Latest News, Dolar Mahmud Videos, Dolar Mahmud Photos, and other Dolar Mahmud Cricket Team players.